Completely fenced and screened in pool area, 100% pet friendly and children will love it. Avery's Beach Bungalow is a beach side house, fully remodeled and updated by one of the finest interior designers. All of the living space is conveniently located on one floor, with a gorgeous outside pool and tiki bar. Three new plasma TVs and DVD players, WiFi internet and cable, if you need to check e-mail or do a little work. A 2 minute stroll to the semi-private beach access, conveniently located at the end of the block. Perfect for afternoon beach activities or sunset walks along the beautiful shores. House comes with king and queen beds, also a convertible chair and an aero bed (perfect for kids). 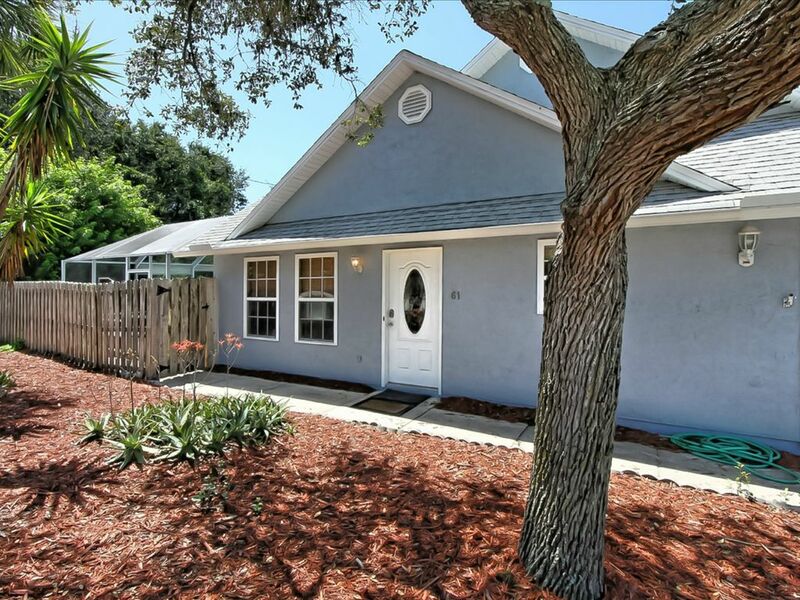 You will absolutely love this house, beach and neighborhood- minutes to downtown and seconds to the Atlantic Ocean. You will feel at home as soon as you walk in the door! We had so much fun staying here. It was just a short walk to the beach, and we really enjoyed the pool! The only thing I would say is maybe an update on the mattresses and the couch. But thank you so much for letting us stay here! We will be back! We had a wonderful stay at Avery's beach house. The home was good size, clean, and well equipped and our family had a blessed stay. The owner, Glenn was helpful and friendly, and always replying to questions and concerns promptly. The pool was not heated- very cold for adults but the kids didn't mind and enjoyed the pool. We enjoyed the chairs and sitting in the sun on the pool deck. The bathrooms were very clean and recently renovated. We loved being able to bring our pup Archie. The walk to the beach was so close and we loved the path and boardwalk. The ocean sunrises were amazing- and the beach uncrowded even over spring break. Areas for improvement could include: updating appliances such as dishwasher and washing machine (the washer made a clicking noise when in use and would disturb those sleeping in the guest room on the adjacent wall.) The beds were comfortable and could comfortably sleep 4 adults. The pullouts worked well for kids- uncomfortable for adults. The lot size is small and it could benefit from some landscaping with grass. But overall we were so happy with our stay and enjoyed St. Augustine and we would love to return again soon! Thank you Glenn and family for allowing us to stay in Avery's beach house! We made some great memories. There was not a lot of clutter in the house so there was plenty of room for our stuff. Tastefully decorated. Clean. Close to shops, dining, Beach. Rental agency was responsive & friendly. Nice neighborhood. We liked being able to bring along our dog. We hope to return soon! Great stay near the beach! My husband and our furbabies had an amazing time at this property! It is in a great location. A short walk to the beach and in a nice quiet neighborhood. The house was well-maintained. We would stay here again. The property owners were nothing but helpful and pleasant! Thanks so much , we have fixed the minor issue with the sofa bed - we look forward to your next stay !